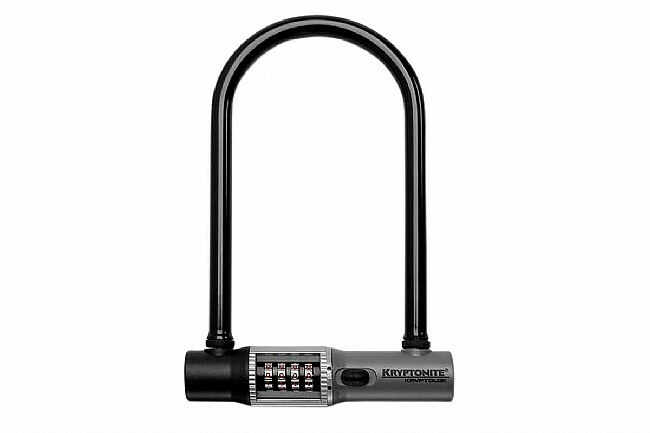 Kryptonite’s KryptoLok Combo holds a 6 out of 10 rating on Kryptonite’s security scale, making it a moderately secure bike lock. This 4 by 8-inch u-lock features a 13mm hardened high-grade carbon alloy steel shackle, a resettable 4-digit lock combo, and Kryptonite’s convenient Bent Foot™ design. Anti-rattle bumpers help minimize noise during transport while protective vinyl coating is gentle on a bike’s paint job. Dimensions: 4 x 8 inches (10.2 x 20.3 cm). Weight: 2.30 lbs (1.04 kgs). 13mm Carbon Alloy Steel shackle. Includes side mount, snap-in bracket.